MUELLER-exclusive HYDRACINN fabric is the moisture-wicking catalyst for maintaining superior support with heat management. Base sleeve is made of antimicrobial fabric that is uniquely breathable, extremely soft to the touch with flatlock seams, and features a conforming hourglass design. MUELLER-exclusive HYDRACINN fabric is the moisture-wicking catalyst for maintaining superior support with heat management. Base sleeve is made of antimicrobial fabric that is uniquely breathable, extremely soft to the touch with flatlock seams, and features a conforming hourglass design. Inner grip strips complete the anti-sweat/non-slip design to help prevent brace migration and preserve high-performance support. This comfortable brace provides support for stiff, weak or unstable knees, as well as protection after injury. Upper strapping system locks brace in position. Outer mesh shell with bidirectional stretch fabric fastens on the sides then comfortably locks across the quadriceps. Flexible steel springs support both sides of the knee, yet allow leg flexion and extension. Tibial Containment System features a custom secondary shell with stabilizing patella buttress and rear support strap. 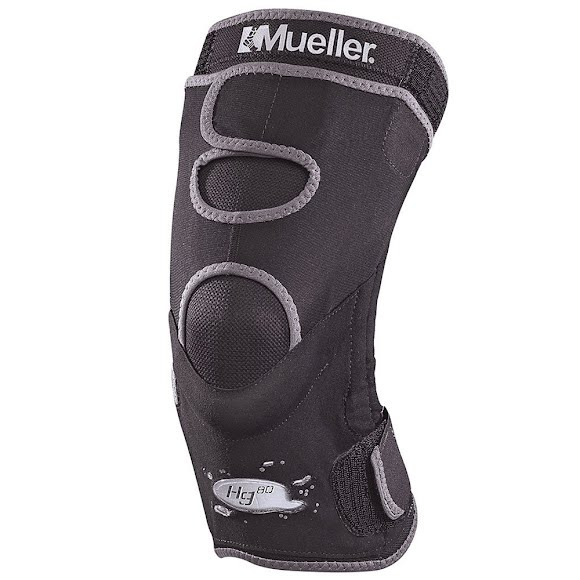 Mueller exclusive HYDRACINN fabric is a revolutionary moisture wicking and neoprene free material that keeps performance and comfort in balance.